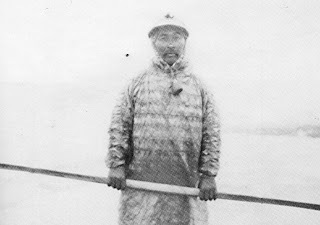 Skinboat Journal: How did the Aleuts hold their paddles? How did the Aleuts hold their paddles? Did I already address this issue once before? Maybe. Well, I'm addressing it once again. 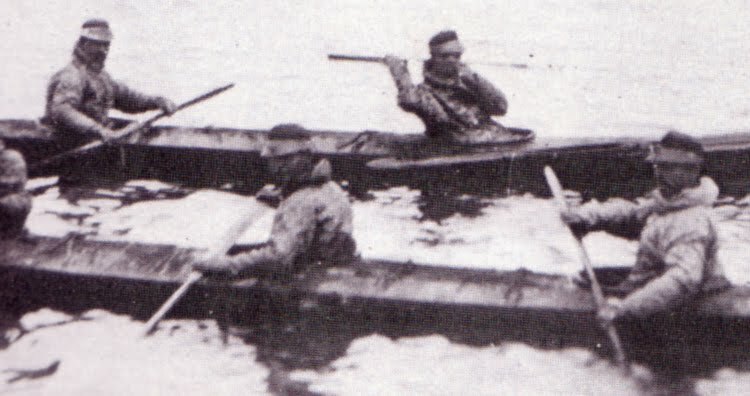 The question is, did Aleuts hold their paddles ridge side back or flat side back when paddling? The answer is unclear, at least given the photographic evidence I have. 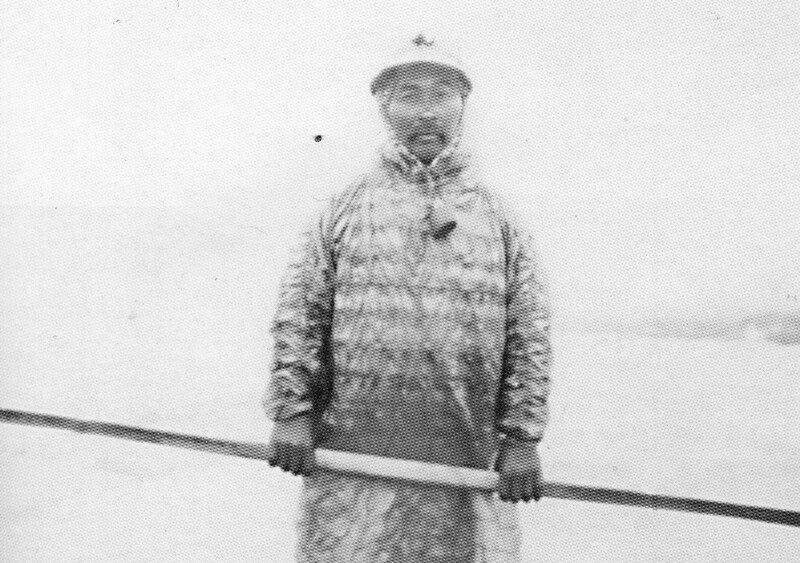 Thanks to a generous sharing of images by Jeff Dickrell of Unalaska, I have a number of vintage photos of Aleut paddlers as evidence. I am presenting these photos here and the answer is that at least in photos, paddlers can be seen holding paddles both ways. What makes the evidence ambiguous are two factors. One is that the photos aren't always clear enough to determine how the paddlers are holding their paddles. The other is that the photos are staged, that is, the paddlers had to maintain their position within camera range and so are possibly paddling backward to keep their kayaks in the frame. As a consequence, they may have reversed the normal paddle orientation. In any case, and without further ado, I offer up the photos with appropriate commentary. Keep in mind that blogspot software reduces image size to the point of uselessness for this sort of analysis. So to see the images at a reasonable size, you have to click on them. Here we go. Here are two guys with their paddles unambiguously facing flat side back. The guy in the back isn't actually holding his paddle, but we can assume that he is resting it the way he paddles it. The guy in the front has an interesting grip on his paddle, that is, with the hands out on the base of the paddle blades and the fingers curled around the blade ridge. Is that how he paddled or is this just a hand position for bracing and positioning the boat for the camera? Here, both the front and back paddlers are holding their paddles flat side back. The guy in the middle is bracing with an extended paddle stroke putting the paddle in an invisible position. This is clearly a posed picture meant to illustrate how the guy in the bow throws a dart while the guy or guys in the back steady the boat. Out of the frame on the left of the lower boat, the bow man is aiming a rifle. The guy in the lower right and the guy in the upper left are both holding their paddles flat side back judging by the curve of the loom. The guy in the left foreground is bracing so it's hard to tell paddle orientation. In this photo, the guy in the bow is clearly paddling ridge back. The guy in the middle is hard to tell and the guy in the back likewise is hard to tell. Plus he is doing an extended paddle brace where anything seems to go. Finally, another picture that doesn't prove anything except that some Aleut paddles had very short looms. A paddler using this kind of paddle would almost be obliged to hold his paddle at the root of the blades like this guy is doing and the most comfortable way to do that would be ridge forward, flat side back. I always find this debate interesting, really. I'm always hoping for ridge back. There is a pretty strong lobby for the ridge back way of paddling as being the right way, but when I started looking at photos I found the evidence inconclusive. Then I started paddling the Aleut paddles both ways and what I found was that it takes a different stroke depending on which way you orient the paddle. Likewise, depending on whether you want to hold the paddle mostly ridge back or flat back, you will want to shape the loom and root of the blade differently so that it feels comfortable in your preferred orientation. Given the lack of paddles in museum collections, it's hard to tell what way the paddles were most comfortable to the hand. Also, you really have to use a paddle in the water and not just hold it on land to figure out how it works best. So I think the answer continues to be that a right or a wrong way can't be determined.